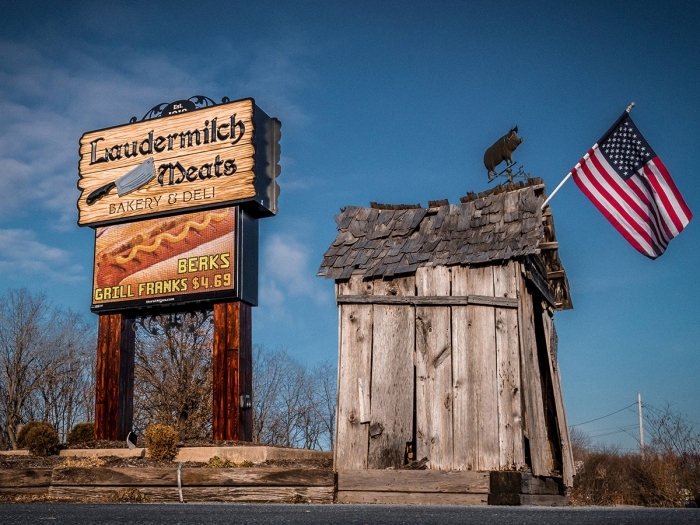 Laudermilch Meats in Annville, Pa., is a family-owned business that found the secret sauce to staying in business for almost 100 years: offering the highest quality meats and made-from-scratch foods along with old fashioned customer service. Known for their choice cuts of meats, the retailer also carries a full menu of meals to go, bakery items, desserts and deli products. To get the word out about its menu and specials, the company used an on premise letter board sign that employees changed weekly. “We could only advertise three specials a week, and changing the board was time consuming and inconvenient, especially in the winter,” said Dave Laudermilch, the owner. Looking to expand its advertising, the company began running more visual ads on a local digital billboard. When it became clear that their wooden on premise sign should be replaced, Laudermilch turned to Horst Signs of Myerstown, Pa., to design a sign that married the old-time charm of the meat market with modern advertising technology. Below the market’s new identification sign is a 3' x 6' Watchfire digital message center. Now, Laudermilch Meats can advertise specials featuring photos designed to draw people into the store. “With our own digital message center, we own the entire board and have greater flexibility in changing our messages,” said Laudermilch. “The sign is able to show to the outside world what we have inside the store.” Laudermilch said he sees a lot of new faces in the store since installing his new sign, and that customers have mentioned the sign as their reason for stopping in. Horst Signs specified Watchfire as the manufacturer because they have a history of standing behind their products. Laudermilch did his homework and viewed on premise signs in the area, noting that Watchfire signs were better quality and clearer than those of other manufacturers. “Some signs from other manufacturers weren’t even working,” he said.